Yangzhou, where Marco Polo once served as a municipal official, is a city with a history of 2,500 years, tracing back to the Spring and Autumn Period when it was called Guangling. The city was one of ten cities in the world around 1800 A.D, which had the largest population over half million. The city has been well known for its once brilliant historic role in Chinese history and one of the first 24 cities that were announced as the Historical and Cultural Cities in China. Until the 19th century, Yangzhou acted as a major national political, financial and trade center and a transport hub duo to its excellent location at the junction of the Yangtze, the Grand Canal and the Huaihe River. This historical period had left Yangzhou a large number of treasures, including valuable architectures and arts, splendid culture and well-known celebrities. Situated in the middle part of Jianghuai Plain and on the north bank of lower reaches of the Yangtze River, Yangzhou has now been one of national tourist centers and has attracted tourists worldwide. 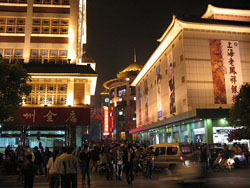 As a prefecture-level city jurisdiction, Yangzhou governs three urban districts and four satellite cities/county. As the improvement of financial situation in China and in Jiangsu province, the city has been receiving more financial funding in an intention from the governments to protect its old town for tourism. The project may bring a spending of millions of dollars in coming years and those old houses, alleys, lanes, originally facing tearing-down, would be under the new protective by-laws.